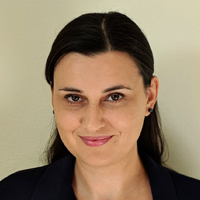 Zoi Gkalitsiou joins the CSD faculty in the fall of 2018 as an Assistant Professor. She received her bachelor’s degree in Speech-Language Therapy from the Technological Educational Institute of Epirus, Greece, her master’s degree in Speech-Language Pathology from the University of North Carolina at Greensboro, and her Ph.D. in Communication Sciences and Disorders from The University of Texas at Austin. Gkalitsiou’s clinical and research interests include the nature and treatment of stuttering and fluency disorders in children and adults. Specifically, Gkalitsiou is interested in investigating the linguistic and cognitive factors that contribute to the development and maintenance of stuttering using eye-tracking methodology, exploring the manifestation of stuttering in bilingual and multilingual speakers, and improving evidence-based practices in stuttering. Gkalitsiou has published her research in a variety of journals including the Journal of Fluency Disorders, the Journal of Speech, Language, and Hearing Research, the American Journal of Speech Language Pathology, Clinical Linguistics and Phonetics and others, and has presented her work nationally and internationally.